I knew something wasn’t right early on in my pregnancy. I had this weird feeling, so my husband, Dennis, and I decided to do the genetic testing that is done at 12 weeks. After the ultrasound tech finished, she sent the MFM doctor in to go over our results. Dennis asked if everything looked ok, and the doctor said not exactly. He explained to us that our baby’s heart was on the wrong side. He said it could be a number of things or it could be nothing. It didn’t matter what he said. In that moment, our world was flipped upside down. We were immediately told to do a more thorough genetic blood test and to come back at 15 weeks. Fast forward to 15 weeks. Before our appointment, we found out we would be having another boy and that he didn’t have any other major chromosome disorders. We had another long ultrasound, and this time the MFM was able to clearly see that our baby had CDH. Those three letters hold so much weight in our world from that moment on. The doctor went on to give a not so great picture of what was in store for our little guy and also mentioned that if we were going to terminate we would need to decide soon. There was no question that we were going to fight for our baby, so termination was out of the question. Over the next 17 weeks, we transferred our care over to our local Children’s Hospital. At the time, we were very happy with our survival odds. They said because his liver was down he would have a 75% chance if not better. At 32 weeks, I went in for an MRI, and we were completely blindsided. His liver was up. Not just a little bit but 50% up. The doctor said it was probably up the whole time but was too hard to see. Our 75% odds now went down to 13%. 13%. That number will stick with me forever. They were basically telling us that our baby was not going to survive, and if he did, he wouldn’t have a great quality of life. Knowing all of that we proceeded on and hoped that our boy would be the exception. That he would beat all of their odds. A few weeks went by and over that time I joined a few CDH Facebook groups and kept seeing a doctor’s name pop up. Then I was directed toward the TinyHero website by another CDH mom where I read story after story about a Dr. Kays and how amazing he was. I called my husband on a Friday morning at 7am and told him to check out the TinyHero webpage. By the end of the day, both Joy (CDH coordinator) and Dr. Kays called us. Dr. Kays talked to us for over an hour and gave us an 80-85% survival rate over the phone. For the first time, we felt like our baby was going to survive. He asked us how fast we could get to Florida, and we were on a flight the next day. We left our 19-month-old and the rest of our family back in WI because we had faith that Dr. Kays could save our baby. 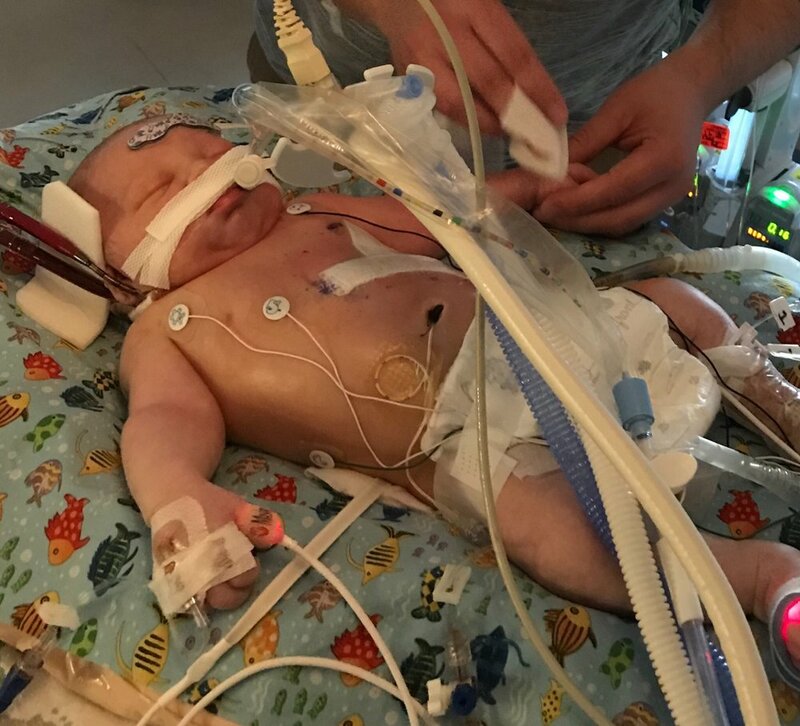 1/4/18 Repair surgery- Camden ended up with about 45% liver up, 19% lung volume, and less than 1% of his diaphragm. We spent a total of 67 days in the hospital. There were so many highs and lows during that time, but the only one that matters is that Camden survived. Our baby who was only given a 13% chance was not only going home but a perfectly happy and healthy baby! During our time in the hospital, Camden suffered from reflux which is very common for CDH babies. After we got home, Camden’s reflux got much worse. After being home for 6 days, Camden stopped breathing and was rushed to our local hospital. While there, he stopped breathing again and had to be reintubated. At that point, we requested to be transferred back to Florida, so Cam could be under Dr. Kays’ care. When we got back to Florida, Dr. Kays performed the Nissen and gtube surgeries. From there, we had a few struggles with getting Cam to eat, but we got through it and after 49 more days in the hospital, we were discharged again. I hope by sharing Camden’s story that another family will read it and realize that you don’t have to settle for 13%. Our 13% just turned a year old and is doing amazing! Cam completes our family, and we have Dr. Kays and the rest of the CDH team at Johns Hopkins All Children’s Hospital to thank.